How do you make the most concealable full-power pistol even better? Offer it in all major self-defense calibers, that’s how. When the Springfield Armory® XD-S® arrived on the scene in 9MM and .45ACP , its svelte profile quickly made it the pistol to beat for concealed carry. The thin, single-stack design allows it to melt into the body when carried, yet it’s shockingly easy to control. Even those with larger hands can get most of three fingers on the grip. Practice is everything, so rather than go for uncomfortably and uncontrollably small, we aimed to create a handgun that’s easy and pleasurable to shoot while still offering amazing concealment. 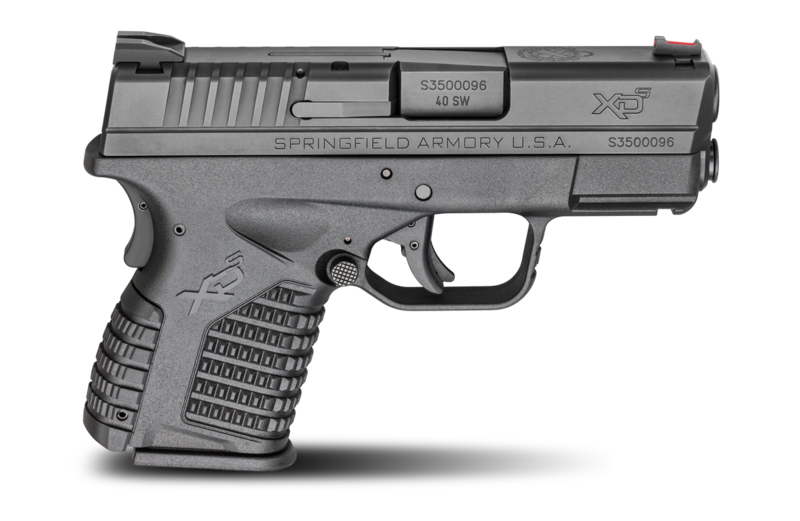 You’ll enjoy your range time with the XD-S® and become a better shooter as a result. For 2016, we’re introducing the XD-S® in the ever-popular .40SW , so you can choose the mix of power and capacity that makes you comfortable. Like the originals, the new XD-S® .40SW comes with both flush (six-round) and Mid-Mag (seven-round) magazines, so capacity of the new .40SW model sits right between that of the 9MM and .45ACP XD-S®. We’ve designed the XD-S® to fit you – not the other way around. Interchangeable backstraps customize grip circumference. We even include matching magazine sleeves so the Mid-Mag (7 Round) fits seamlessly too. To make the XD-S® durable, yet portable, we used the right materials for the job. The black polymer frame saves weight while the forged stainless steel slide and Melonite® hammer forged barrel put strength where it’s needed most. The sights are designed for speed with a fiber-optic front sight that leaps into the sight picture. Don’t like the color? That’s OK , we include green and red tubes – take your pick. The rear combat-profile sight offers a simple notch so there are no distractions to divert attention from the front sight. Put it in your holster, and you’ll find that it’s Noticeably Unnoticeable™.